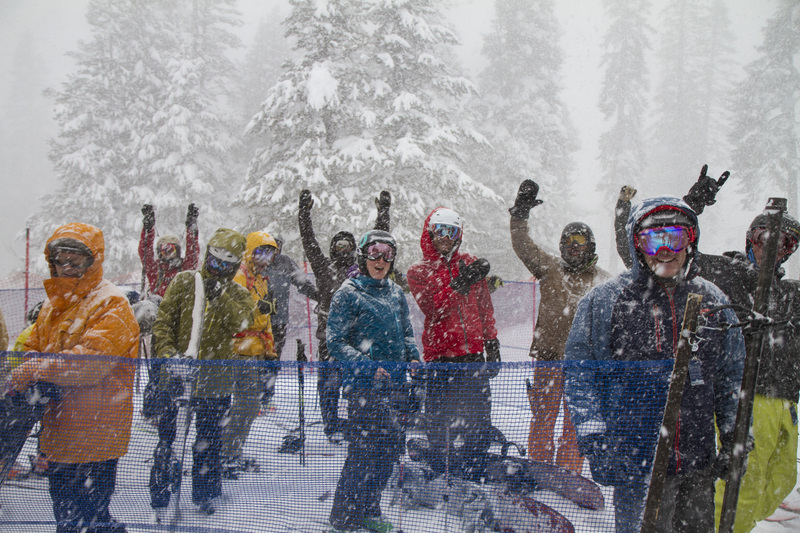 It is a “feast or famine” season for many Sierra ski resorts. The “feast” part is the deluge of snow that has fallen in the first half of this season. As of early February, the Sierra snowpack was the deepest it had been in 22 years for the mid-point of a ski season, according to state officials. The “famine” part came on some days when skiers and snowboarders could not get to resorts because either they had shut down due to conditions or guests could not get to the slopes because of closed roads or violent storms. One especially vexing period occurred in early February when Highway 50, the main artery connecting the Bay Area and South Lake Tahoe, was closed following a huge landslide, and I-80, the link between the Bay Area and North Lake Tahoe, was mostly shut down at the same time due to another slide. That is unlikely, according to several resorts, considering that February-April weather patterns indicate a lot more snow is coming. In mid-February, Mammoth double-checked the snow depth at the 11,000-foot level and concluded that the base depth there was 28 feet at the time. 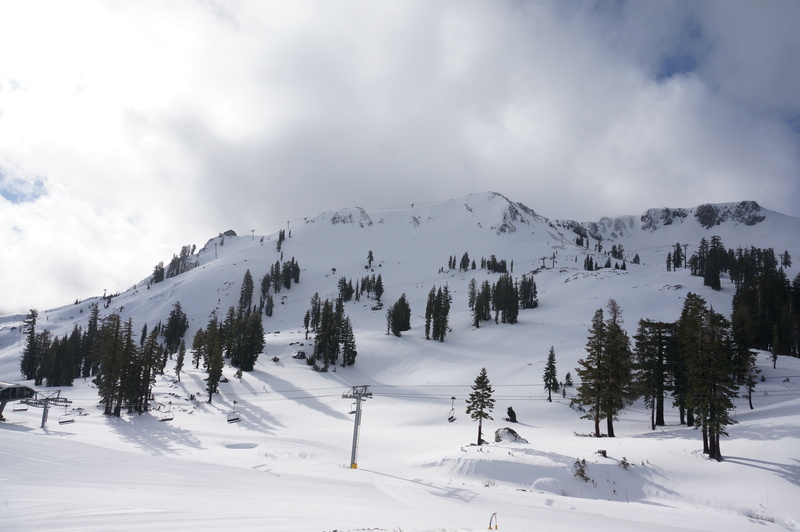 Squaw Valley and Alpine Meadows are two other resorts that typically are open into the summer months after copious amounts of snow fall. Homewood ski area, which is in a somewhat protected area on the west side of Lake Tahoe, was only closed for two days prior to Feb. 1 because of storms and power outages that affected the region. The return of a big winter to the Sierra has brought to the mountains many winter sports enthusiasts who have not traveled there for some time. Reitzell was asked if additional profits the ski resorts should tally this season will translate into spending money for new lifts and runs this summer. They were doing a major victory dance at Squaw Valley on Tuesday night. And why not? 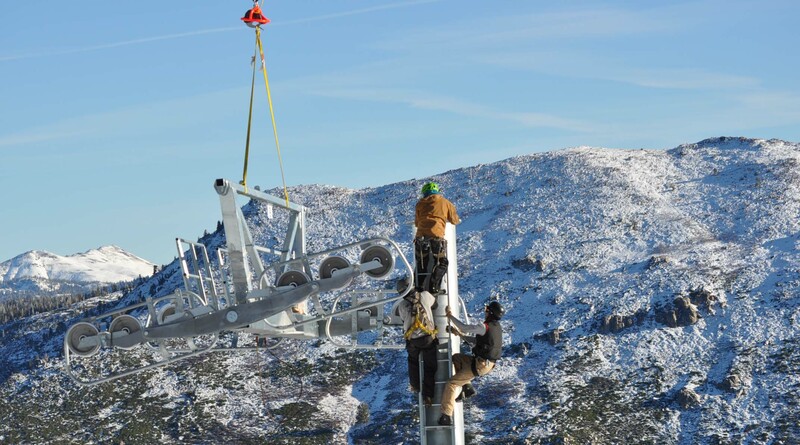 Earlier in the day, the Placer County Board of Supervisors had given final approval to the long-waited expansion of Squaw Valley, a project with an estimated cost of up to $1 billion. Although some local residents and incoming Sen. Kamala Harris opposed the expansion, the board gave it the OK on a 4-1 vote. Harris and others had argued that the project would add to pollution, noise and traffic woes. The Placer County Planning Commission had earlier signed off on the project. 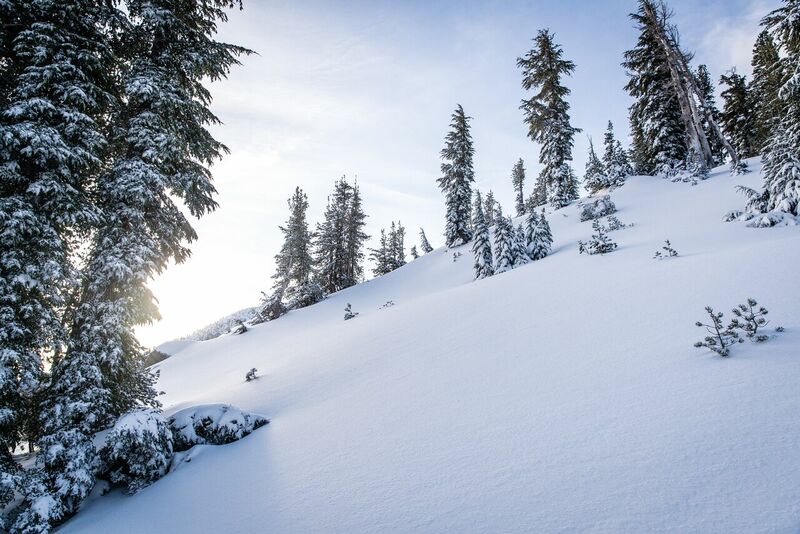 Squaw’s Valley’s approved master plan would in effect turn Squaw into a four-season resort. 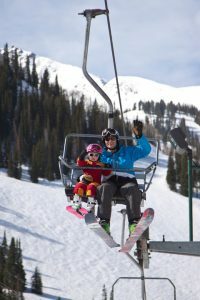 It is already a prime winter ski resort with more than 170 trails and runs spread out across 3,600 skiable acres. Under the plan, nearly 1,500 motel rooms, condos, timeshares and retail space in Squaw’s Olympic Valley would be built over the next 25 years. A 90,000-square-foot indoor adventure center and water park will be built. Andy Wirth, president and CEO of Squaw Valley Holdings, said that 90 percent of the development will happen on existing asphalt parking lots at the base of the mountain that are already zoned for such development. There is no pending litigation at this time that would potentially block the project. How soon will construction start? 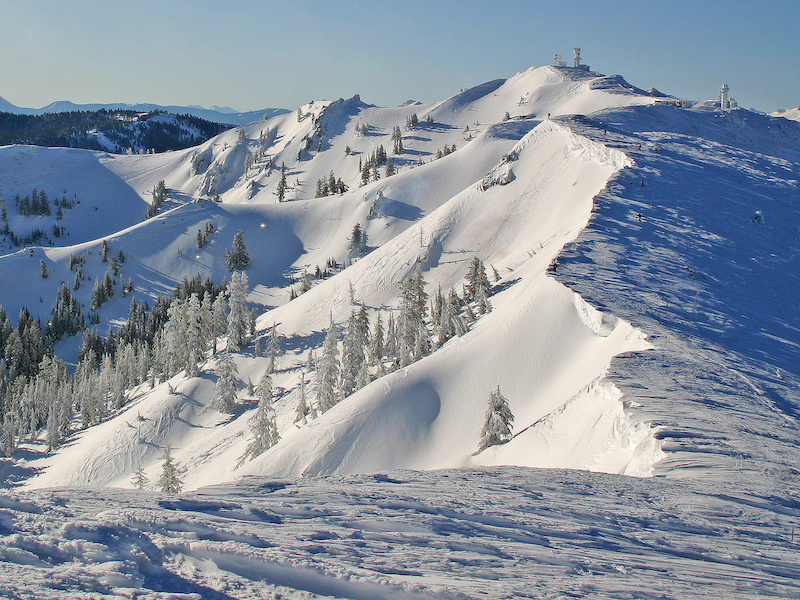 “With the project passed, we will initiate the detailed design work necessary to refine the plan and create buildable plans and begin the search for developers to work within the project design guidelines,” said Liesl Kenney, public relations director at Squaw Valley/Alpine Meadows. It is estimated that $22 million in annual tax revenue will be generated by the project. The money will help fund public services including schools, road improvements, transit services and public safety. Tahoe Donner, one of the largest cross country ski areas in the West, has embarked on a major expansion program. Earlier this year, already boasting some 100 kilometers of Nordic trails in the Sierra just outside Truckee, the resort bought Crabtree Canyon, an adjacent 640-acre tract of land. Another 16 kilometers of cross country terrain will open in the canyon for visitors this winter. 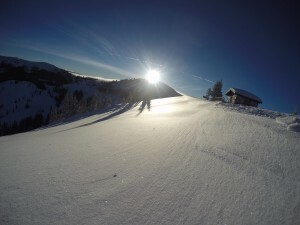 Steve Miller, board president at the Tahoe Donner Association, said, “There is some spectacular terrain in the canyon with double black diamond, blue and green-rated trails so skiers of different abilities can enjoy Crabtree. Tahoe Donner purchased the site from the Truckee Donner Land Trust for $500,000. The trust had originally bought the property from private interests for $2.4 million. The Tahoe Donner Association purchased Crabtree Canyon from The Truckee Donner Land Trust in April. For next year, the Land Trust is in contract to purchase nearby Carpenter Valley. It will manage the property for year-round recreational enthusiasts. There is a long-term plan to extend the linked trail systems from the Alder Gulch Adventure Center through Euer Valley, Crabtree Canyon and Carpenter Valley to the Independence Lake Nature Preserve. Perry Norris, executive director of the Truckee Donner Land Trust, said, “Carpenter Valley is one of the most spectacular – and little known – valleys in the entire Northern Sierra. Preserving the pristine natural beauty of our surroundings and ensuring continued recreational access is of utmost importance to us, especially that its less than 10 miles from downtown Truckee. Once acquired in July 2017, the property will be open to the public for the first time in over a century. Tahoe Donner is one of the largest homeowner associations in the country with nearly 25,000 members and 6,500 homes and condos spread across more than 7,000 acres. The Nordic and downhill ski areas, along with the golf course and several other Tahoe Donner attractions, are open to the general public. The cross country area has been surging in popularity. Last season, USA Today took a national poll of skiers, checked out numerous resorts and concluded that Tahoe Donner is one of the top three Nordic resorts in the country. Brinn Talbot, director of marketing and member services at Tahoe Donner, said that frequent snow storms last season helped propel both the alpine and cross country areas to record years. Cross country visitors were up 33 percent over the previous record year and downhill skier traffic increased 17 percent over the earlier record year. The association does not releases visitor numbers. The resort’s popularity also is tied to the fact that nearly all of the trails are groomed. 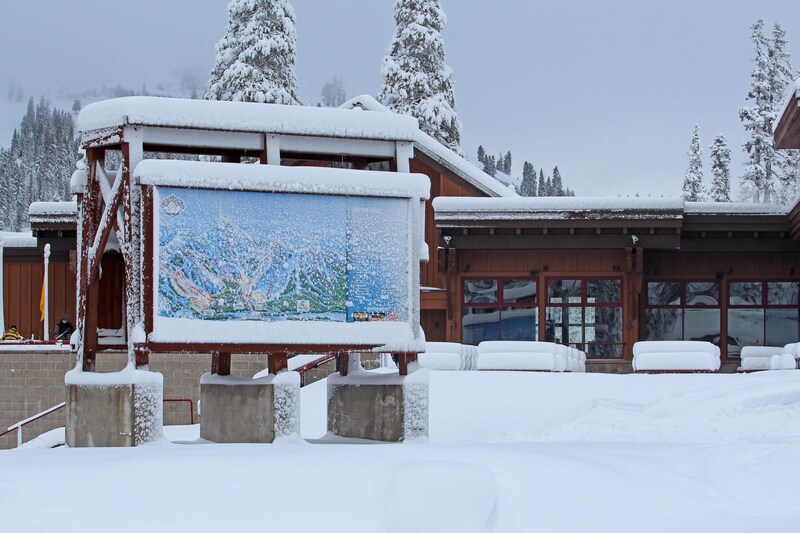 Tahoe Donner also opened the Alder Creek Adventure Center last year. The large structure serves as the home base for Nordic buffs with a cafe, rental services, wax rooms, a retail store and other amenities. During the summer, the building houses Tahoe Donner’s Equestrian Center and Bikeworks operation. Many of the Nordic trails are used in the summer by hikers, bikers and horseback riders. Like most of you, we’ve been to Mammoth, Squaw Valley, Heavenly, Sun Valley, Jackson Hole and other big-name resorts around North America. This winter, some friends and I decided to do something totally different and visit Kicking Horse and Revelstoke in British Columbia. These are a couple out-of-way sprawling ski resorts southwest of Banff and surrounded by awesome, cloud-piercing peaks that remind one of the Alps. Both have at least one thing in common: they have the two highest vertical drops among all Canadian ski resorts. 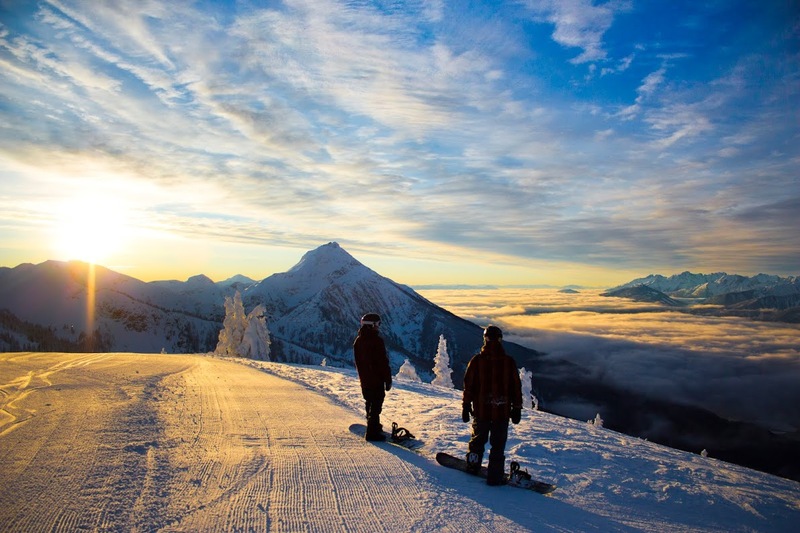 Revelstoke, in fact, has the biggest vertical drop of any resort in North America at 5,620 feet. How does this translate to the skiing? We took one endless intermediate run at Revelstoke that rolled on for 4,200 vertical feet. That is comparable to skiing top-to-bottom at Lake Tahoe’s Alpine Meadows not once but twice. At Kicking Horse (4,133-foot vertical drop), where we started our four-day adventure, the 16-year-old resort is 15 minutes outside Golden, British Columbia, which is about three hours west of the Calgary airport. 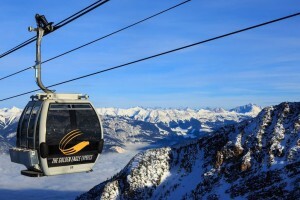 Kicking Horse has 128 runs, an eight-person gondola, three chair lifts and more than 85 in-bounds chutes. 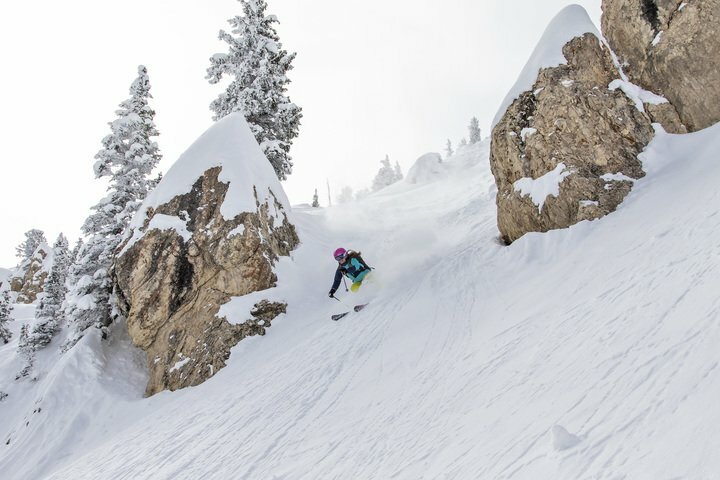 There is plenty of skiing here for all ability levels, but with all the steep terrain (60 percent of the slopes are rated expert or advanced), this place is a mecca for powder-hungry experts. Perhaps the best vantage point to enjoy the stunning scenery is the Eagle’s Eye restaurant. Located at the top of the gondola, it sits at 7,705 feet and is the highest-elevation restaurant in Canada, offering commanding views of five national parks. Down lower on the mountain, you can visit with Boo, the on-slope, 900-pound resident grizzly bear. Boo was orphaned in 2002 when his mother was illegally shot by a hunter. He lives in a 22-acre enclosure and has lots of company during warm months when he is not hibernating. Last year, 27,000 people took the chairlift to check out Boo. If one does not alpine ski or snowboard, you have a choice of Nordic skiing, tubing, snowshoeing, dog sled riding, snowmobiling or ice skating at the rink in the heart of the village. Hotels, B&B’s and condos dot the landscape around the base of the peak. Nearby Golden is a bustling industrial hamlet of 4,000 souls. It has a large lumber mill and is a transportation hub with the Trans-Canada highway and the east-west railway line running through. It boasts a number of highly acclaimed eateries including Eleven22, Whitetooth Bistro Cedar House and Turning Point. Next, we headed up the highway for a 90-minute drive to the town of Revelstoke. The ski resort, which has only been around since 2007, sits just outside of the town, which has a population of 8,000. Both Kicking Horse and Revelstoke top out around 8,000 feet, so altitude sickness is not much of a problem. 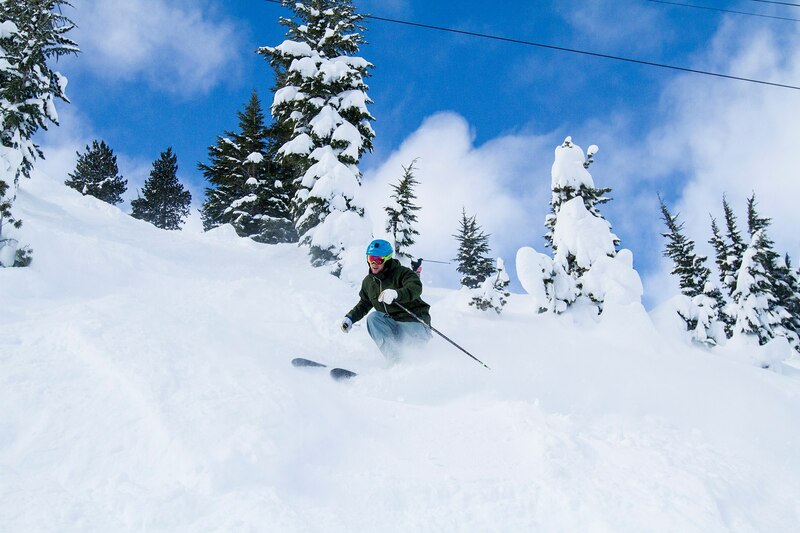 Revelstoke has a vast amount of terrain fed by two chairlifts, a gondola and a magic carpet. One could spend virtually all day here on one run. The Last Spike, a winding novice choice, rolls on for 9.5 miles before it hits the bottom. 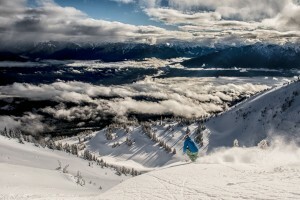 Revelstoke’s 65 “named runs” includes a good mixture of green, blue and black-diamond runs. Some come here just to ski the trees as the glades are everywhere, both tight and fairly wide open. The Revelstoke area is known as the capital of helicopter skiing in Canada. The resort is the only ski resort in the world to offer lift, snowcat, helicopter and back-country skiing from one village base. There are rooms at the base but the clear winner appeared to be the 221-room Sutton Place Hotel, which opened about six years ago. It boasts “luxury ski-in/ski-out condo-style accommodations” with daily rates ranging between $250 and $1,200 during the winter. Food tip – the Thai curry soup at the Revelation Lodge is a 10. Skiing in Canada is easy on the wallet right now as the exchange rate is quite favorable for Americans. The adult, walk-in, lift tickets at Kicking Horse, for example, are priced at 92 Canadian, which works out to about $65 in U.S. coin. Lift tickets at Revelstoke are even cheaper.